So, on the heels of writing a story about a 10-year-old boy who goes on an amazing adventure, I’ve been considering adventures in general. Most of the time, when I hear the word adventure, I think of some enormous thing, a grand action or feat, like climbing Mount Everest or, as in Eli’s case, hiking through the Amazon rainforest. But, as summer wanes and school days draw near, I am spending more of my time consulting school supply lists than I am searching through maps or reading about exciting day hikes in the mountains. I am, however, embarking on a different kind of adventure. August 14, the official “my-first-book-is-really-going-to-be-published-O-M-G” release date is only seven short days away and that seems like a pretty HUGE adventure. Although, to be honest, right now it is feeling more like a challenge. Writing the book was the fun part. Now, I am wading through the details of promotion websites and giveaway submissions just to try and get someone to read what I’ve written – I mean, anyone! And, I have to tell you, it’s not fun. I feel like I am standing in a quagmire of social media advertising and every little move I make is sucking me in deeper! My 12-year-old has also spent the last few days in a perpetual state of anxiety. He is leaving behind his beloved elementary school, a place where he spent the last six years of his school life, and moving on to that ominous land of inbetweens, JUNIOR HIGH. When he saw that his school supplies this year included a graphing calculator and that the cross country team practices EVERY MORNING at the crack of dawn, he grimaced and looked as though he himself were contemplating a trip to Everest. Adventure then, perhaps, is not always just one huge act. It can also be a collection of small acts, small steps away from the routine, into the unknown. One of my favorite authors, J.R.R. Tolkien, wrote, “It’s a dangerous business, Frodo, going out your door. You step onto the road, and if you don’t keep your feet, there’s no knowing where you might be swept off to.” Both my son and I are on the precipice of something new, something different and even the smallest step towards that newness feels like an awfully big adventure. And, ready or not, it is time to step onto the road! The second book in the series of Where’s Eli Moore? takes place somewhere in the Western Hemisphere. Think you might know the location? Reply to this post with your guess and see if you are correct! So, it’s late July and I am gathering momentum to get the debut Where’s Eli Moore? book up and running. I’m excited and also terrified as I let my newest character, Eli Moore – an intelligent, adventurous, highly imaginative, 10-year-old – loose on the world. I am also very busy. My four kids, however, ranging in age from 5 to 12 are in the midst of extreme deep summer boredom. The types of boredom that trudge around our house these days are various. My 7-year-old boy has succumbed completely to the “all-I-want-to-do-is-play-video-games” type of boredom while my 10-year-old is getting his entertainment by pestering, poking and aggravating everyone else in the household including me and my husband. My 12-year-old has made an art form of lying motionless in front of the television or lying motionless in front of a book (at least he’s reading…I guess!). My 5-year-old girl walks around and moans about how she wishes school would start so she could have girls to talk to (Yep, having three older brothers is sometimes not all it’s cracked up to be). Now, don’t get me wrong. I LOVE the summer and so do my kids. During the school year, we run around like squirrels, wiggling ourselves all over town for soccer practices, play rehearsals, basketball games, church activities, school activities, and homework. Oh, yes…don’t forget the hours of homework! So, when summer rolls around, we all breathe a big sigh of relief and collapse into a “no activity zone”. The first two months of summer are filled with lakes, pools, hikes, water fights and all such wonderful stuff including a lengthy trip to Grandma and Grandpa’s house. But, then, late July rolls around and it gets hot…I mean, really hot. Going outside feels like a chore and our little house feels cramped and slightly, well…sticky? AND, there’s that sneaky little pull in the pit of your stomach that tells you school is just around the corner, waiting to carry you away again into squirrel-land and you have to make the most of the last few weeks of summer. It all results in a restless boredom that makes everyone grouchy. I call it LESSDOM. So, last weekend, in response to the evils of LESSDOM, my husband and I decided to load the kids up into the minivan and drive up to the mountains just outside of Santa Fe to go for a walk. It was a desperate move. We’ve been on plenty of hikes already this summer and the temperature outside was 95 degrees. Still, we had to try. Before we even left the house, my 12-year-old complained about how hot it was going to be. Then, my 7-year-old demanded that he needed to finish level 20 on his blah-blah-blah game. The 10-year-old was up for the trip, but proceeded to pull the 5-year-old’s hair who then cried and said she was too tired for a hike. My husband and I looked at each other and then shoved them all out of the front door. The ride up wasn’t too bad. There were a few more whines and arguments from the backseat. Then, we were there, a small loop trail called Black Canyon that winds back into Hyde Park on the edge of the Santa Fe National Forest. We walked through the Black Canyon Campground to the trail head. The trail itself was thankfully shaded most of the way, covered overhead by tall pine trees and carpeted by dense pine needles. And, then, something magical happened. We saw a butterfly. It was a Cabbage White butterfly – small, white, very common. But, with that one animal sighting coupled with the sharp smell of pine and the thick, orange bark on the trees, a flip was switched. There was no more complaining about the heat, no more pulling hair and no more video game obsession. That all gave way to discussions about how beautiful and mysterious the trail looked when you turned to look behind you and how many kinds of butterflies actually live in a pine forest and how the shade from the trees really saves you from the summer heat. It ended up being a fabulous day for butterflies. We must have seen at least 20 individuals and about five species all told. At the far end of the loop, just as we were turning back towards the beginning of the trail, I spotted a quick movement to my right. I knew right away it was a lizard of some sort, but figured it was a little whiptail, a type of lizard we see all the time around our house. Upon closer inspection, however, it turned out to be a horny toad lizard. None of us had ever seen one in real life and my husband reached down to catch it. It hissed and puffed itself up, so he wasn’t able to grab it. Finally, we coaxed it onto a wide piece of bark and held it up so that each of the kids could get a really good look. Then, we let the little guy go, free to scamper away from us pesky humans. The hike ended in a surprise summer sprinkle that brought cooler temperatures and thunder in the distance. As we all got back into the minivan, I thought about Eli Moore and how his adventure, like ours, had led him to a lizard. 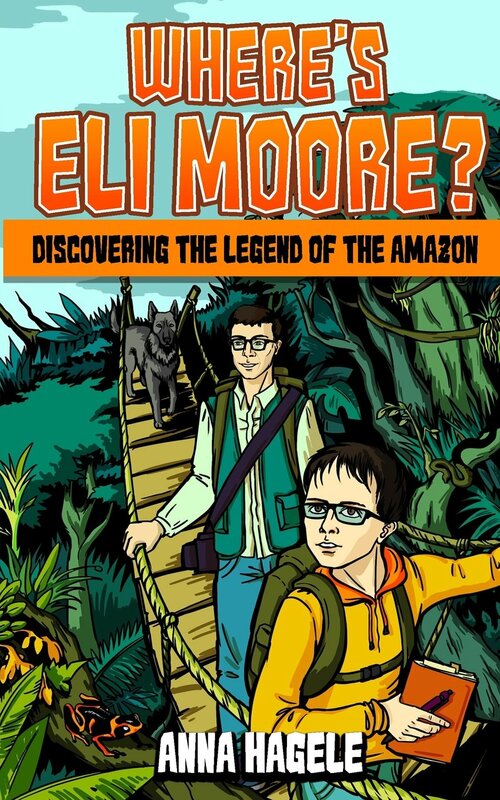 I also thought about how Eli’s adventure had opened his eyes and mind to the wonder and mysteries of the world around him and I felt like, even though we hadn’t crossed halfway around the world to do it, we had experienced much the same thing. We had fought off LESSDOM and found that there is still adventure and wonder to be found in the world – even in late July.